Free copies available, if you're quick. I'm all for cosmetic DLC that affects bits of a game you can actually see. (By contrast, purchasable character skins in first-person games seem a little silly.) 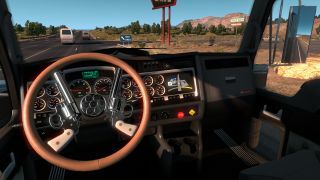 So here's a new bit of downloadable content for American Truck Simulator that adds a load of fancy new steering wheels. The Steering Creations Pack whacks in 20 new steering wheels, based on actual parts made by specialist manufacturer Steering Creations. That one up there is the clear best, but you can also find a couple of garish, radioactive-green wheels, a fiery red number, and some other, less flashy steering wheels. The DLC will set you back £1.99 or whatever that is in your local currency, except it totally won't if you manage to bag a free copy by visiting SCS Software's Facebook or Twitter pages. There are details of that time-limited offer here, but it only applies to the first 30,000 entrants, so hurry, I guess? SCS are currently in the process of embiggening American Truck Sim with larger roads and more space around them. They've been at that a while, so hopefully we'll see the fruits of their efforts soon, via a promised free update.